I had a long conversation with Stephen Lewis yesterday. Old timers may remember he’s the guy who produced the USDAA Grand Prix videos early in this century. We chatted about collaborating on a publication that makes use of text and pictures with links to external video/digital recording. Okay, it’s not smashing new technology. The idea is to support courses we use in League Play with training publication. It’s more than likely that many of the clubs that participate in the National Dog Agility League will do so alongside their training classes. That’s practical. So, wouldn’t it be fun to have a training pub that anticipates training objectives on the set of equipment? Right now I’m busy planning for an upcoming series of classes here. The series is called “Intensity Agility”. It should be a lot of fun for me. We set high standards, make homework for everyone; and we do a lot of drill and practice. We’ll begin with the NDAL/Top Dog March course. I’ll share my preparation for that class here… if you’ll wait just a few days. Questions comments & impassioned speeches to Bud Houston Houston.Bud@gmail.com. The web store is up and running: www.dogagility.org/newstore. 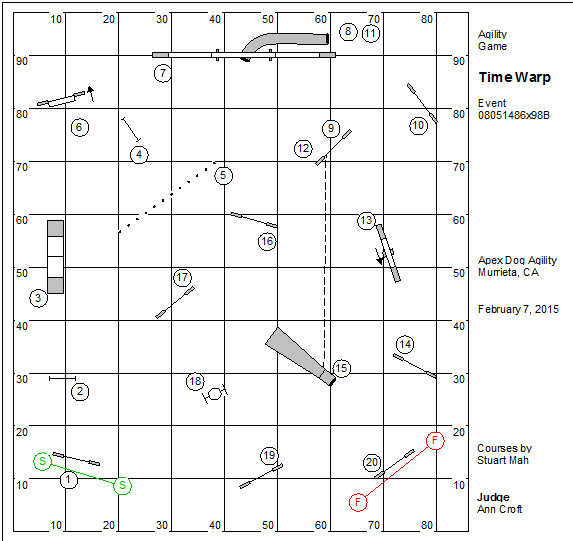 The Book of Agility Games is a perfect reference for the conduct of agility league play. A key element for competition with the National Dog Agility League is the open challenge of a game or course. 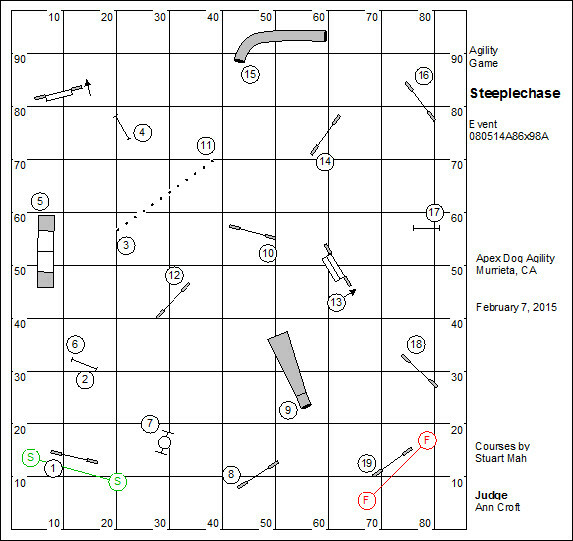 What this means is that the agility course is an artifact that is forever open to competition observing the same placement of equipment, scoring basis and rules for performance. We ran an agility league at Dogwood Training Center for eight years. This was a training center with more or less 150 students a week, who for the most part participated in league play. 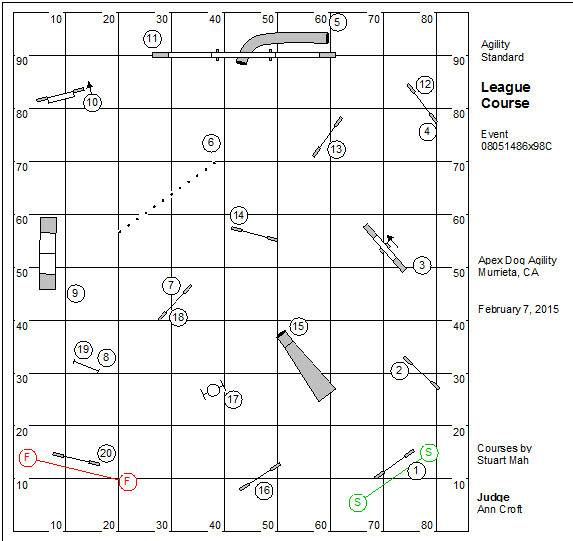 While I have saved all of the old courses (documented forever in the pages of The Just For Fun Agility Notebook), I did not save the scores or even the rosters of participants. Today I’m absolutely intrigued by how I might do with the generation of dogs that I now own… competing against a younger version of me, and another generation of dogs. In 20 years somebody might want to compete on that same course and have a go at the high score set by some World Team superstar (long time passing). Another utility of the course or game as historical artifact is as a teaching tool. The intrepid agility teacher might put up the same course to students every year; and track their progress by the improvement of scores in that game. Seriously, think of the possibilities. I have a guy working on a reporting system interface for the internet. It’s not done yet. Until it is done I’m the recording secretary and will do everything by hand. I’m hoping my guy gets something in place fairly soon. Recording scores is a boatload of work. We’re starting a series of classes here at Country Dream that we’re calling: Intensity Agility! To be honest the intention of these classes is to require the best effort from our students. That means that we’ll set a demanding pace, establish firm objectives, assign homework, and test the efficacy of both practice and homework. Marsha has challenged me to design the full suite of course-work in advance. This will include a “Game of the Week”, lesson plans, and homework. The “Game of the Week” will be designed for a 90′ x 60′ working space and will automatically go into the Catalog of Games and Courses that I mentioned above. I will no doubt share those courses with you here in my blog. Invitations are going out today to join play in an agility league that spans the United States, with the possibility that we’ll be joined by players in other countries. Our objective is to create an organization that will oversee the business of that league, the National Dog Agility League (NDAL). It is a big project than will take a community of smart and hard-working people to realize. The invitation will include a single course or sequence that fits a space approximately 48′ by 90′. Everyone who sets up the course and reports scores in the month of March will become de facto founding members of the NDAL. Initially this is intended as a foundation for the reality show for which we are producing a “sizzle reel” that hopefully will inspire some network to bring to life. The theory is that having a team on the television running a course will be a powerful motivation to agility fans everywhere to put up that same course. If you would like to be included in this first invitation, send me an email. I’ll be sure that you get it. On February 7th and 8th 2015 a relatively small field of agility enthusiasts gathered to create the beginnings of a “reality show” for television based on the sport of dog agility. The basic premise of the show … we will follow the coaching and preparation of the “Top Dog Team” who will compete on a regular basis on courses that are published as a challenge to the entire agility world. This means, for example, that an agility club in Australia, or South Africa, or Pennsylvania can host one or more teams who will run that same course and report their scores for the express purpose of competing against the team on the Top Dog show. It’s really an interesting concept, if you think about it. We can use social networking tools and modern technologies to bring the world together to play our favorite game and roll all of the scores up into a single event record. Our coach and the chief talent for the show will be Nancy Gyes. Nancy attended the competition with a team of world class players. “World class” is my word choice, thoughtful and accurate, IMHO. Nancy’s team were all very nice people, and delightful to work with over the weekend. When I was doing my green-screen interview, Lane (the director) asked me what I thought of Nancy. I told her that Nancy is in our world what Quentin Tarantino might be in her world. The production company was really quite professional and amazing on the Top Dog shoot in Murrieta California. They were focused and diligent and appeared to stay faithful to the original vision of Top Dog. We are so looking forward to the product of their efforts. This is a new organization that will serve as the foundation for the “Reality Show.” The express mission of the organization will be to define and develop the activities of competitive agility league play. At this point in time there is no franchise fee. And frankly the By Laws of the League will be focused on keeping the league recreational and inexpensive. We are faced with gathering talented and enthusiastic people who will assume management of this new organization. Right now you’ll have to get in touch with me. Once we have elected a Board and Director of Communications… I can get the hell out of the way. The NDAL by no means is intended to replace or compete with any existing agility organization. All of those organizations are intrinsic to our culture and are important in the training and development of the agility community. NDAL is what you’ve been training for! We are very interested in the model used by the league or affiliation of clubs in Florida. They run a state championship tournament that sounds like a lot of fun. Somebody get in touch! Aldous Huxley once wrote that experience isn’t what happens to you, it’s what you do with what happens to you. I’d like to share the results with you from our competition in Murrieta California on February 7, 2015. I’m really tickled that these are the same courses we ran at Queen City (Cincinnati,OH) back in August of last year. So in every real sense, this is a single competition that is undertaken by players in different geographically areas. That being said, I’m going to summarize only the results by players in California. As soon as I’m up to the task, I’ll combine results from the two different venues. Our team “F”, by the way, followed what we called the “Queen City” formula. The scores of every dog who was not on a team were aggregated into a single team based on the highest scores in the first two rounds. In the Murrieta California competition, they were the third place team. This is a simple numbered course. The scoring basis is Time, Plus Faults. Follow the numbers, keep the bars up, hit the paint. And have fun. This is a simple game, run like a standard course. The Scoring Basis is Time, Plus Faults, Less Bonus. There is an opportunity on this course to earn a 50 point bonus which is subtracted from the Time, Plus Faults part of the dog’s score: if the handler can stay on the opposite side of the containment line through your dog’s performance of obstacles #12 through #15, then the dog will earn a 50 point bonus. Note that the bonus is lost for any performance faults in the distance challenge. Otherwise, it’s follow the numbers, keep the bars up, and hit the paint. This is a standard course. The scoring basis is Faults, Then Time. Follow the numbers, keep the bars up, and hit the paint. And have fun. You are currently browsing the Bud Houston's Blog blog archives for February, 2015.